Switching to a temperature-control kettle is a simple and effective way to save energy, which is good for the environment and can help to reduce your electricity bills. Even though variable-temperature kettles are relatively low-tech and affordable, there’s still a knack to choosing the right one, so here is a buying guide to help. This may seem like stating the obvious but variable-temperature kettles are still, basically, kettles and so have to tick off all the main points of good kettles. That is to say they need to be quick, quiet and safe. They also need to have an appropriate capacity for the situation in which they are used and it’s a plus if they look good too. The basic idea behind variable-temperature kettles is that you heat the liquid to exactly the right temperature first time instead of heating it to boiling point and then leaving it to cool. Here is a basic guide to the most common temperatures and how they are used. The fact that the AEG EWA7800-U variable-temperature kettle combines a modern, stainless steel exterior with a classic shape means that it will generally fit right into any style of kitchen, while its 1.7L capacity should be ample for most households. This offering from AEG is big on safety with no fewer than three automatic shut-off scenarios (when water is boiling, when the jug is lifted and when there is no water in the jug). You can also open the lid with one hand and when you do it’s easy to put your hand inside to clean the jug. 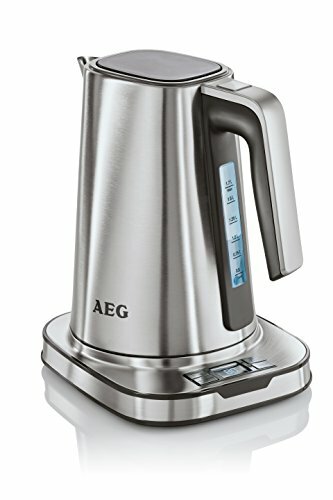 The AEG EWA7800-U temperature-control kettle offers 8 programmable temperature settings and 3 pre-sets, which are Oolong tea (90⁰C), White tea (85⁰C) and Green tea (80⁰C). The digital display on the base shows the water temperature at any given time as the kettle is heating up. Our personal favourite function, however, was the one-cup turbo function which boils 200 ml water in less than 60 seconds. There’s also a handy “keep warm” function, which does exactly what it says. The Aicok also does a good job of blending the modern (stainless steel exterior) with the classic (timeless shape), so it should blend into most kitchens, unless you are going for a super-traditional look. 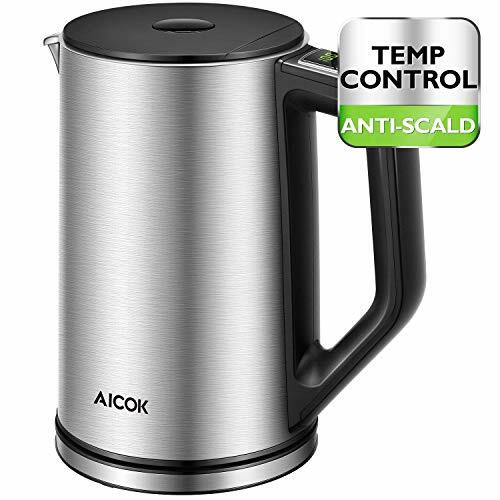 If you’re looking for a kettle with temperature control to fit into a really tight space then the Aicok variable-temperature kettle could be your best option as all the controls are on the handle, meaning the base is the exact width of the temperature-control kettle, no larger. According to Aicok, the unique selling point of this variable-temperature kettle is the patented STRIX temperature-control element, which allows the temperature to be controlled with a precision of +/-2⁰C. We’re not sure how many people will be bothered about that degree of precision, but it’s nice to know. This temperature-control kettle has a default setting of 100⁰C (i.e. standard boiling point) and if you want to change this you start at 35⁰C and move up from there in 5-degree increments. There are the standard quick-boil and keep-warm functions as well as a safety shut-off. We do have a couple of gripes about this variable-temperature kettle. The first is that there’s no temperature pre-sets, but at current time, that’s par for the course with kettles with temperature controls on the handle. The second is that it can be quite hard to see the minimum- and maximum-fill levels as you’re filling the kettle, but you can get around this by marking them on the outside in some way. On the plus side, this temperature-control kettle not only does a good job, but it also has a very decent build quality and, specifically, it’s BPA free, plus it’s comfortable in the hand (even when you’re only using one of them) and therefore safe to use and to clean. The 1.5L size should do most households nicely and in addition to being a variable-temperature kettle, it’s also both quick and quiet. First up, this temperature-control kettle has a very distinctive appearance, which you’re probably going to love or hate. Even if you hate it, however, you might still want to take a look at this variable-temperature kettle because it has a spout which has, literally, been designed for precision pouring. This means that if you’re using old-fashioned tea leaves with a strainer or coffee with a filter, then you’re going to find life a whole lot easier with this temperature-control kettle than with a variable-temperature kettle which has the standard, wide spout. It’s also worth noting, that this kettle with temperature control may be best suited to smaller households as it only has a capacity of 0.7L. Having said that, its speed of operation means that it heats water very quickly, so it might still be a feasible option when there are more than one or two people in a household. With the Diguo temperature-control kettle, all the functionality is in the base. On the one hand, this means that the variable-temperature kettle needs a bit more space on the counter. On the other hand, this makes the temperature-control kettle a bit lighter in use, plus it means Diguo were able to use a wood-look handle to enhance the vintage vibe. In fact, you could say that this is a variable-temperature kettle of two halves, the top half is all classic elegance and the bottom half is actually pretty high-tech. Not only does the Diguo temperature-control kettle have 6 pre-set temperatures (temperatures. 60, 82, 85, 88, 92 and 100⁰C), but from 60⁰C it allows you to set the temperature in 1⁰C increments. It can also keep water warm for up to an hour at temperatures of between 60⁰C and 95⁰C. The temperature is displayed in real time and there’s an auto shut off for safety. 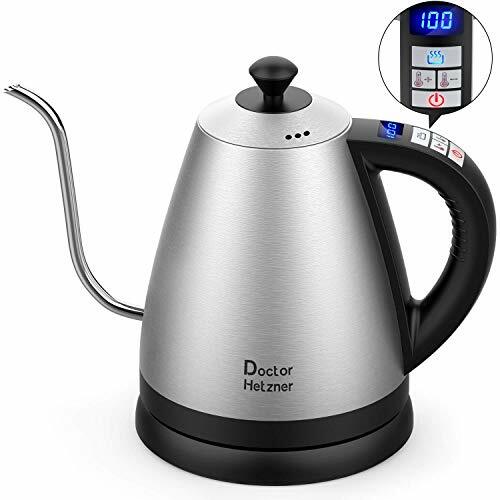 We have to be honest and say that the Doctor Hetzner variable-temperature kettle isn’t exactly the most attractive temperature-control kettle we’ve ever seen, but it isn’t exactly ugly either and it certainly has plenty to offer in terms of usability. The reason why this option looks a bit odd is because it’s a kettle with temperature control in the handle, a fairly substantial capacity and a precision spout. This gives is an “off-balance” look with the handle being quite bulky when compared to the spout, although it’s absolutely fine in use. The handle is perfectly comfortable to hold and the spout does its job of pouring accurately and so will please those using tea strainers and coffee filters, or just filling smaller vessels. As we mentioned, however, this variable-temperature kettle does have plenty of functionality. You can heat water from between 30⁰C and 100⁰C and, if you really want to, you can set the temperature in 1⁰C increments, but if you hold down the button, it will increase in 5⁰C increments, to get you to your desired temperature more quickly. It doesn’t have temperature pre-sets because the temperature controls are on the handle, but it responds so quickly we think this is unlikely to cause an issue for many people. The quick-boil and keep-warm functions are present and correct and the 1.2 litre capacity should be plenty for most households. Finally, this is one of the most affordable temperature-control kettles around and offers superb value for money. If you’re looking for a kettle with temperature control for use in a hard-water area, then you might want to head straight for the Duronic variable-temperature kettle as it has a built-in filter, which fits right against the wall of the kettle to ensure that all the water inside has to pass through it and hence be filtered. Although it fits very snugly inside the temperature-control kettle, the filter can be easily removed for cleaning. Even if you don’t live in a hard water area, this temperature-control kettle could still be very well worth a look, especially since it’s one of the more affordable offerings on our list. We’re going to say up front that the appearance of the Duronic variable-temperature kettle is rather a matter of taste. We’d describe it as “no-nonsense”, but we do really like the fact that the water-level markings on the side are totally legible, even if your eyesight is poor. This is particularly useful given that we doubt many people are going to be continually maxing out the 1.5L capacity. This is another temperature-control kettle where the controls are on the handle, so it doesn’t support temperature pre-sets, but it is easy to work and supports temperatures from 40⁰C to 100⁰C. The usual fast-boil and keep-warm settings are both available. In short, this variable-temperature kettle is an affordable, no-nonsense workhorse, which will especially please larger households and/or people in hard-water areas. 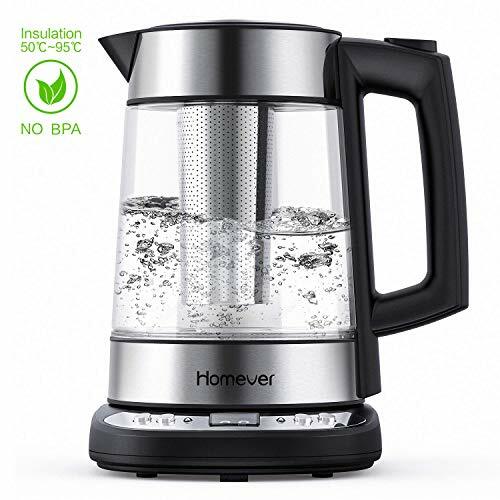 The Homever variable-temperature kettle has a very modern look about it, so may not be ideal if you have a traditional and/or rustic kitchen. That said, even if you’re going for the vintage look, you may still want to look at this temperature-control kettle as it packs a whole lot of functionality into a very small footprint (and very reasonable price) plus a lot of people find it pleasant to watch the water bubbling away through the glass sides. It also has a 1.7 litre capacity, which may be appealing to larger households. One slight gripe about this variable-temperature kettle is that although the controls are in the base, there is a lack of temperature pre-sets. We suspect this was done to keep the footprint to a minimum and possibly also to keep the price down. Another slightly odd feature of this temperature-control kettle is that your choice of temperatures ranges from 50⁰C to 95⁰C. Having said that, this does make sense given that all drinks are served off the boil for obvious reasons. Other than that, this variable-temperature kettle has all the standard functionality you’d expect. Although it doesn’t, technically, have a fast-boil function, the fact of the matter is that the less water you put in any kettle, the quicker it will boil, so it’s a bit of a moot point. It does have the usual keep-warm function and boil-dry protection. It also has a lime scale filter to help those in hard-water areas. 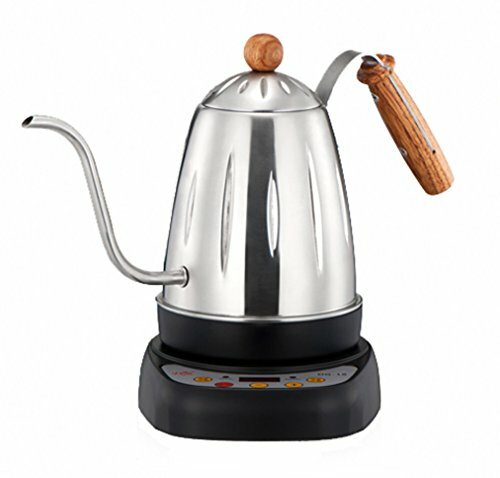 The real stand-out feature of this temperature-control kettle is the fact that it comes with a strainer, which goes into the centre of the jug and essentially allows your variable-temperature kettle to do double-duty as a teapot (or coffee pot, so possibly even triple-duty depending on your beverage consumption). This could make it a good option both for those ditching tea bags and coffee pods for environmental reasons and also a good option for those living in smaller spaces. 【Detachable Tea Filter】 Removable tea filter for making green, white, oolong, black and herbal tea as well French press coffee and hot cocoa . 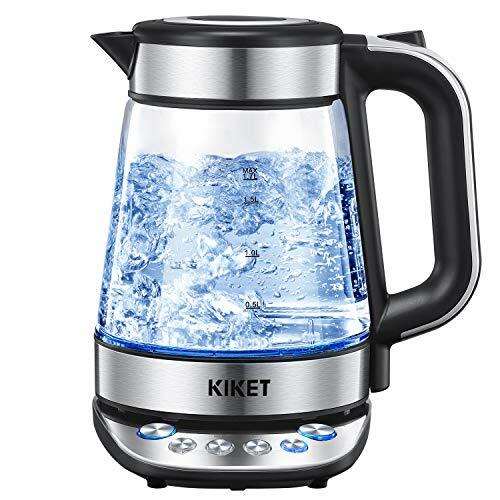 The Kiket variable-temperature kettle also looks very modern and we would say rather minimalist. We do rather like the blue LED light which comes on when this temperature-control kettle is working. The Kliket variable-temperature kettle takes a rather unusual approach to temperature control in that it has four temperature options (70, 80,90 and 100⁰C), each with its own button, so you just press the option you want. This obviously favours those who prefer simplicity to having total control down to the last degree. In fact, simplicity is basically the name of the game with this temperature-control kettle to the point where there’s not really a great deal else to say about it other than that it has a 1.7-litre capacity and that fast-boil, keep-warm and anti-boil-dry functions are all in place. 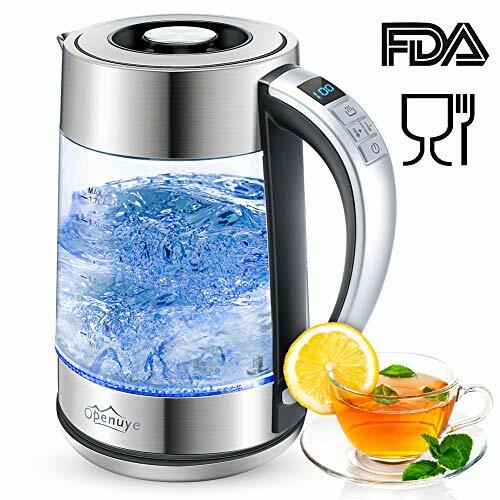 The Openuye variable-temperature kettle is another, very modern-looking kettle with temperature control, which has a glass body and a blue LED which comes on when the temperature-control kettle is in use. The unique selling point of this variable-temperature kettle is that it has the ability to dechlorinate water. Depending on where you live, you may think that chlorinated water is only found in swimming pools, but in actual fact, chlorine is widely used to clean and disinfect water pipes and while it’s perfectly safe to drink (in low concentrations), it can have a perceptible (and unpleasant) taste. If you’ve noticed this in your tea or coffee, then you may want to pick up this temperature-control kettle. As the controls are in the handle, there are no temperature pre-sets, but it’s really easy to set the temperature (between 40℃ and 100℃) by means of the up and down buttons. This temperature-control kettle allows you to specify the temperature to the exact degree for maximum control. Fast-boil, keep-warm and auto-shut-off functions are all supported as standard and the 1.7-litre capacity allows you to make up to 8 cups at a time. 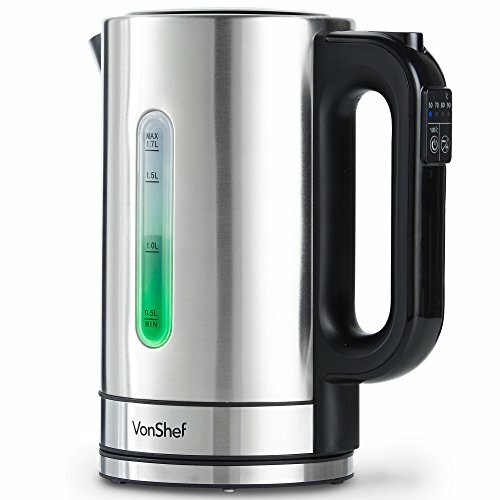 This variable-temperature kettle from VonShef comes in two versions, which VonShef classes as with and without a base. This is actually a bit confusing as in reality both versions have a base its just the version “without a base” has all the controls in the handle, whereas the version “with a base” has the controls on the base. As far as we’ve been able to tell, the functionality is exactly the same in both versions and both have a 1.7-litre capacity, so which one you pick is really a matter of preference. We’ll say here that this temperature-control kettle looks nothing special. It’s certainly not ugly, it’s just not going to be “functional art” either. We do, however, appreciate the clear water-level markings on the side of the jug and the fact that, regardless of which version you buy, the markings on the control buttons are similarly easy to read. In fact, simplicity was clearly front and centre in the design of this kettle with temperature control. The “without base” version has one button to move “up and down” between the four “non-boiling” temperature options (50, 70, 80, and 90℃) plus a separate button to go directly to 100℃. The “with base” version has one button each for the four supported temperatures, which are 70, 80,90 and 100⁰C. There’s no “fast boil” as such but boiling speed always depends on how full the kettle is in any case, you do get keep-warm and auto-shut-off functions. As a final point, this VonShef variable-temperature kettle does have one very neat trick up its sleeve, which is that the internal LED light changes colour depending on which temperature you pick. The practical reason for this is that it helps you to double-check that you’ve picked the right temperature option, but honestly it just appeals to our sense of fun. 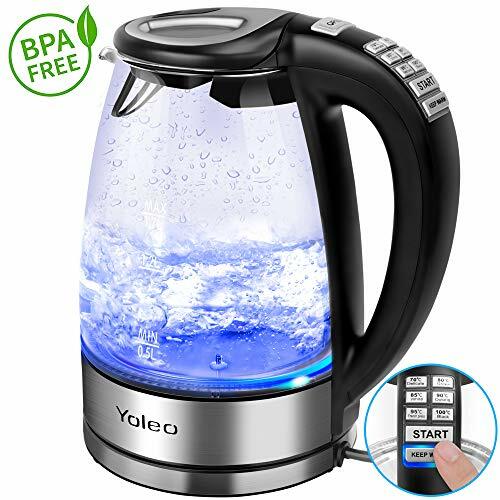 The Yoleo temperature-control kettle is mostly glass and as such will fit unobtrusively into most kitchens. It has its controls in the handle, the appearance of which rather reminds us of an old-school calculator and we mean that in a really good way. If your eyesight’s not what it used to be (or you’re buying a variable-temperature kettle for someone with poor eyesight), then you should definitely give this option a look. To make life easy for the user, the handle contains just 6 buttons, one for each of the supported temperatures (70, 80, 85, 90, 95 and 100⁰C) plus a button each for “Start” and “Keep Warm”. The printing is a nice, legible, black on a white background and the area around each button lights up when the buttons are pressed. As an added bonus, each of the temperature buttons is labelled to show its suggested use e.g. 70⁰C is marked as “Delicate”, which could be very helpful to older people who still think in Fahrenheit. This temperature-control kettle has a capacity of 1.7-litres and all the usual safety features are present and correct, including the auto-shut-off function. 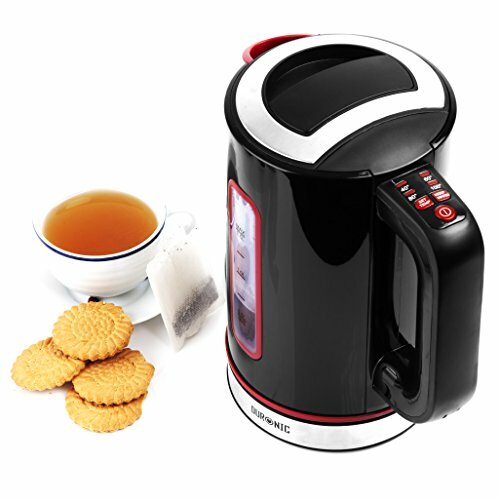 As always, the best variable-temperature kettle is the one which is right for you and your situation. If you’re in a small space – try the compact Diguo or the multi-tasking Homever. If none of these apply, then your choice of temperature-control kettle will probably come down to a combination of capacity and appearance as all the variable-temperature kettles in our list have the basic functionality covered, have robust build quality and are safe and comfortable in use.